“Meanwhile, the pain–shooting, stabbing, constricting pain–was getting worse. At some level, I knew what was happening: my brain was damaged,” she wrote. “For a few moments, I tried to will away the pain and the nausea. I said to myself, ‘I will not be paralyzed.’ I moved my fingers and toes to make sure that was true. Clarke was taken to the hospital, where a brain scan revealed that she had suffered a “subarachnoid hemorrhage,” an arterial rupture aneurysm. The first surgery had been minimally invasive, but when Clarke woke up, she had “unbearable” pain and her field of vision was constricted, and she couldn’t remember her name. After finishing Season 3, Clarke went in for a brain scan and doctors told her that the growth had doubled in size and that it should be taken care of. Another surgery was up next, but the procedure failed. She emerged from the operation with a drain coming out of her head, some parts of her brain replaced by titanium. Read Clarke’s full op-ed here. We're so glad she's ok.
Emilia Clarke Says 'Game of Thrones' Gave Her Confidence The actress spoke about playing Daenerys Targaryen in the hit series. 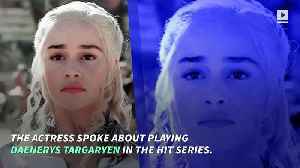 She admitted that playing someone as "daunting as anything"..
Emilia Clarke says although it was "daunting" playing Daenerys Targaryen on 'Game of Thrones' she has learned a thing or two from her fearless alter-ego. Emilia Clarke Reveals Life-Threatening Aneurysms Caused Part of Her Brain to ‘Die’ Clarke recently revealed she was diagnosed with a subarachnoid haemorrhage in 2011. On April 7, she appeared on.. According to Business Insider, Emilia Clarke had an unforgettable first day on the "Game of Thrones" set. In a video for the HBO show's YouTube channel, the actress who plays Daenerys Targaryen..
On “CBS This Morning” Emilia Clarke talked about her two brain aneurysms in 2011 and 2013. 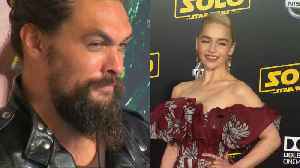 According to Business Insider, Clarke had surgery for the aneurysms during her time with “Game of..
Jason Momoa struggled to control his emotions as he spoke about "nearly losing" former ‘Game of Thrones’ co-star Emilia Clarke when she suffered two brain aneurysms.